Yeah, gave me peace of mind my daddy never had. 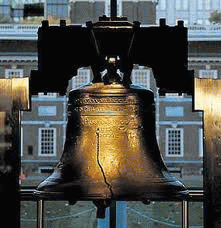 -- Elton John, Bernie Taupin, "Philadelphia Freedom"
It is well known that Philadelphia was the birthplace of the U.S. Constitution and American democracy. Less well known is that it was also the birthplace of public banking in America. The Philadelphia Quakers originated a banking model involving government-issued money lent to farmers. The profits returned to the government and the people in a sustainable feedback loop that prospered the local economy. Both landmark events will be commemorated in upcoming gatherings in Philadelphia. On April 7th, during Occupy Philly's celebration of its six month anniversary on the mall in front of Independence Hall, the Occupy Philly General Assembly reached consensus in support of the National Gathering Working Group proposal to hold an Occupy National Gathering at the same location from June 30 to July 4, 2012. The endorsement included a commitment by Occupy Philly to provide the resources necessary to make the first Occupy national gathering in history a resounding success. The stage was thus set for what could be a revolutionary event located at the historic birthplace of the First American Revolution. Resonating with that theme, on April 27th-28th the Public Banking in America Conference will be held at the Quaker Friends Center in Philadelphia, hosted by the Public Banking Institute (PBI). PBI's vision is to establish a network of public banks across the country to generate affordable credit according to the priorities of real people, not corporate persons or banks. These priorities include student loans, sustainable agriculture, worker-owned coops, renewable energy, and so on. The Bank of North Dakota, currently the only publicly-owned depository bank in the USA, has over two dozen loan programs reflecting the priorities of the people of North Dakota. Freeing the American people from the economic injustices perpetuated by Wall Street is what Occupy Wall Street is all about. We have become slaves to the economic power of Wall Street and their political lackeys. We now pay obscene amounts of interest to private bankers in exchange for the necessities of life. The American public thought it was chasing the two pillars of the American Dream: getting an education and buying a house. Now both of these pillars have been used against us to further the interests of Wall Street. Student and mortgage debt are used to club us into servitude. Samuel Adams said of those whose allegiance was to money: "If ye love wealth greater than liberty, the tranquility of servitude greater than the animating contest for freedom, go home from us in peace. We seek not your counsel nor your arms. Crouch down and lick the hand that feeds you. May your chains set lightly upon you; and may posterity forget that ye were our countrymen." Oh, Philadelphia freedom, shine on me; I love you. After over six months of OWS protests over economic injustice, the Occupy National Gathering and Public Banking in America Conference will look at solutions, inspired by the revolutionary efforts of those who came before us in the birthplace of American freedom, Philadelphia.